AfriClassical: The Croydon Citizen: In life and death, was Samuel Coleridge-Taylor just a victim of racism? The Croydon Citizen: In life and death, was Samuel Coleridge-Taylor just a victim of racism? 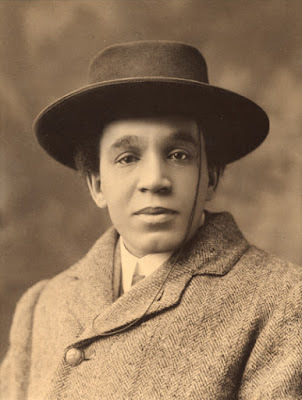 Samuel Coleridge-Taylor (1875-1912) is profiled at AfriClassical.com, which features a comprehensive Works List and a Bibliography by Prof. Dominique-René de Lerma, www.CasaMusicaledeLerma.com. Photo by Bob Walker, used under Creative Commons licence. 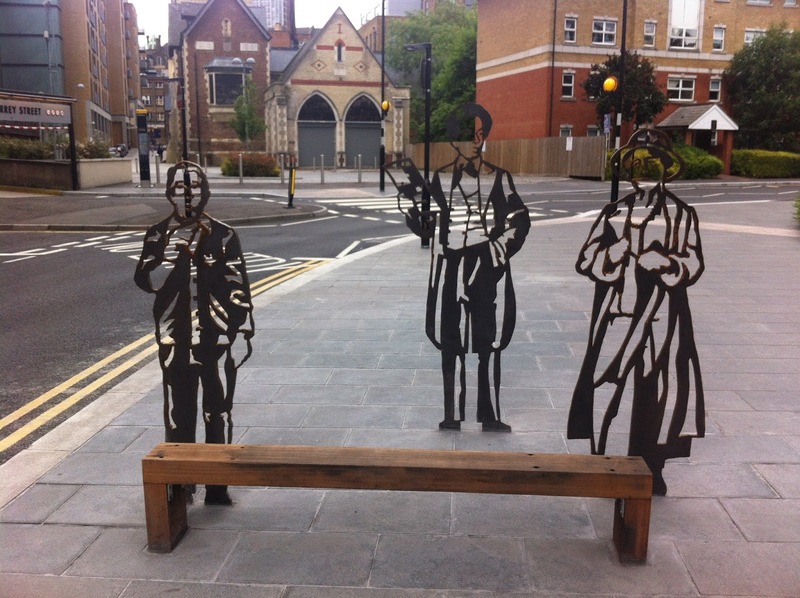 Take a stroll down Charles Street, an otherwise unremarkable road in Croydon’s old town, and you’ll reach a curious sculpture depicting three of Croydon’s most famous residents. 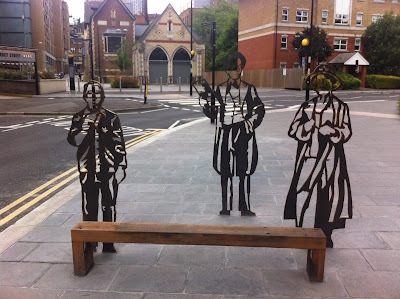 The figures, as voted for by the public, are the recently-deceased comedian Ronnie Corbett, celebrated actor Dame Peggy Ashcroft and composer Samuel Coleridge-Taylor. The fact that this monument is tucked away, almost forgotten, in a back street most often used to access a multi-story car park, is a curiosity, albeit one that seems somehow typical of Croydon’s unique and often perplexing character. It most certainly befits Samuel Coleridge-Taylor’s own legacy. Outside Croydon, he is a largely forgotten figure in classical music and even within the borough’s borders he is under-appreciated, wheeled out by teachers as a subject for Black History month and then tucked away again until next year. And that is a true shame, because Samuel Coleridge-Taylor’s story is a remarkable one. Indeed it is one that would be considered remarkable if he was born today, let alone in the late nineteenth century. The details of his early life are murky. His father, Daniel Taylor, who the young Samuel never knew, was a Creole from Sierra Leone; his mother, Alice Martin, was a white woman from Holborn, central London. The area he was born in was described by Charles Dickens, no less, as “the dingiest collection of shabby buildings ever squeezed together”. It isn’t known how Coleridge-Taylor and his mother escaped these inauspicious beginnings and ended up in the comparative luxury of Croydon, in those days sedate suburbia yet to be engulfed by the city. However it happened, Coleridge-Taylor fell on his feet: his mother married George Evans, a railway storeman, who became a father figure to Samuel. It was in Croydon that Coleridge-Taylor received his first music lessons courtesy of a Colonel Hebert A. Walters, the choirmaster at St George’s church, awakening a rare and unexpected talent. This talent was enough to earn him a scholarship at the prestigious Royal College of Music. Samuel excelled in his studies and was quickly propelled into the upper echelons of English music. Soon after graduating, his music was being published and he won the Lesley Alexander composition prize for two consecutive years. Indeed. his first major commission was from the great composer Edward Elgar. For anyone making a career in the music world at that time this was validation of the highest order. Samuel Coleridge-Taylor was critically lauded, being famously labelled ‘the African Mahler’, as well as being hugely popular. His choral music was played at concerts across the country and his acclaim peaked when he released Hiawatha’s Wedding Feast in 1898. Despite this, he was not always rewarded for his efforts and had sold the rights to Hiawatha for only £25 15s. When it was revealed that his family would receive no royalties from the song after his death, it caused a scandal in the music world and became one of the landmark cases in establishing the Performing Rights Society, a organisation which exists to this day to ensure that musicians are paid when their music is performed commercially. Coleridge-Taylor was forced to work as a conductor, a music teacher and an adjudicator at various festivals and competitions to make ends meet, but he was far from finished. At college he had met an American poet named Paul Laurence Dunbar who added words to his music in a series of collaborations and awakened his interest in his African roots. This brought him to the attention of the United States and African-Americans often sought him out when visiting London. His popularity across the pond was such that on one visit to the US he was invited to meet Thomas Jefferson, the then president. This was no small thing for a mixed-race, illegitimate child of the slums to achieve in the early twentieth century. Perhaps more remarkable still was the fact that while in America he was allowed to conduct all-white orchestras on a tour in 1910: this in a country that didn’t allow black people to sit in the same seats as white people on the bus more than fifty years later. He was a busy man, much in demand. Sadly, however, the strain of furthering his music career, working his day jobs and being a doting father and husband took their toll on him. In August 1912 Samuel Coleridge-Taylor collapsed at West Croydon station, aged thirty-seven. He died a few days later of pneumonia and was buried in Bandon Hill Cemetery in Wallington. His was a short, eventful and important life. Might the author have confused Samuel Taylor Coleridge with Samuel Coleridge-Taylor on a few key points? Thomas Jefferson?